CHARLOTTE — After Charlotte built a solid lead, Eddie Basden was determined not to see it disappear. But East Carolina, led by Mike Cook's 22 points, had other ideas. The 49ers built a 19-point lead early in the second half, only to see the Pirates whittle it down to eight with 4:26 left. The 49ers' Chris Nance was assessed a technical and ejected with 3:12 remaining for pushing Corey Rouse in the face while both struggled for a loose ball under the Pirates' basket. Cook hit one of two free throws to cut the Pirates' deficit to seven. 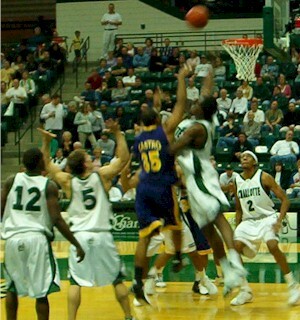 That's when Basden gathered his teammates under Charlotte's basket. ``I told them we needed to regain our composure. They had made their run and now it was time for us get a run back, and as you see, we made that happen,'' Basden said. The 49ers went on to outscore the Pirates 10-5 to close the game, including going five-of-six from the free-throw line in a 72-60 victory Saturday in their Conference USA opener. Basden scored 18 points and had eight rebounds. Curtis Withers had 15 points and 10 rebounds and Mitchell Baldwin added 12 points for the 49ers. The win was the seventh consecutive one for the 49ers (10-2, 1-0), a streak that is Charlotte's best since winning seven straight in the 2001-2002 season. Cook's 22 points was tops among the Pirates, who had no other player in double figures. Corey Rouse added 12 rebounds to the ECU effort. The Pirates (5-9, 0-2), who lost their second game in a row, had an 18-12 lead with 11:54 remaining in the first half, then Charlotte scored six straight to tie the game and went on to build a 39-26 halftime lead. ECU's next game is Wednesday when the Pirates tangle with another league foe, 23rd-ranked Cincinnati, in Minges Coliseum's Williams Arena. Tip off for the game is 7 p.m.
Records: ECU 5-9, 0-2; Charlotte 10-2, 1-0. 3-Point goals: East Carolina 2-14 (King 2-4, Castro 0-1, Kilgore 0-1, Hammonds 0-1, Rouse 0-1, Cook 0-2, McNeil 0-4); Charlotte 5-18 (Plavich 2-8, Baldwin 1-2, Drayton 1-2, Goldwire 1-5, Basden 0-1). Rebounds: East Carolina 36 (Rouse 12); Charlotte 40 (Withers 10). Assists: East Carolina 13 (McNeil 6); Charlotte 14 (Baldwin 4). Total fouls: East Carolina 19, Charlotte 14.